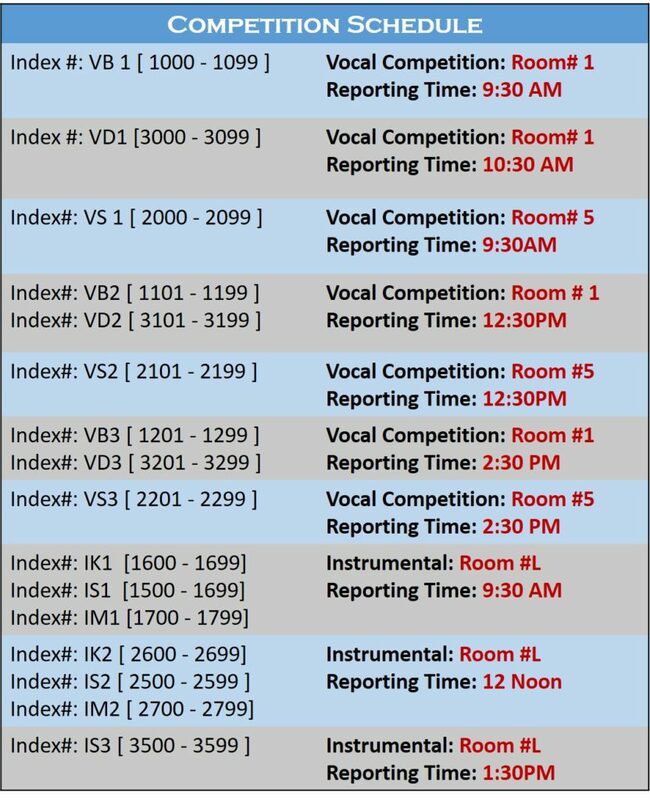 You may send us the track (if you plan to use one) to save your preparation time in the competition room. Please visit the Registration Desk based on your schedule. You will receive an Index # Tag before entering the competition room. Please make sure you inform the Index # to the judges or Art N Beat Representative. Your time starts as soon as you enter the room, so please be prepared with any track or accompaniment device. Each participant will have 5 min max from entry to exit. If you are using any track, you may do one of two things: bring the track in an empty flash drive or a cable that will connect to a Windows laptop if you choose to play from your phone. There will be an electrical outlet to connect the accompaniment devices. Art N Beat will not provide any connectivity cable. Preparation to connect your device/phone/flash drive should not take more than 30 sec. Once the judges inform you to start or ring the bell, please start immediately. No re-take is allowed. If you make any mistakes, please continue with your performance. Once the judges, ring the final bell, you will have 30 sec to complete. Once you are done, please come back to the registration desk to receive your participation certificate. Qualified participants will be informed about the finale competition in front of Kavita Krishnamurti & Dr. L Subramaniam by Mid July.